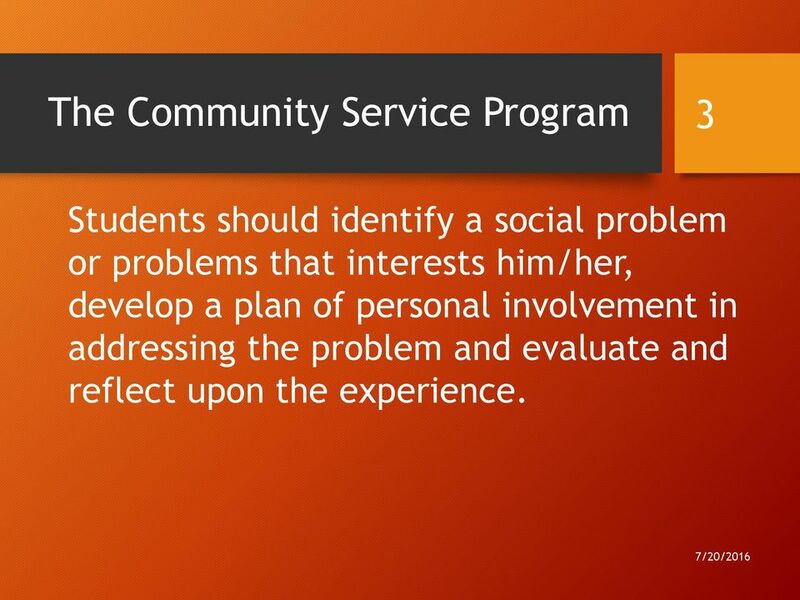 Download "Understanding Community Service for High School Students"
3 The Community Service Program 3 Students should identify a social problem or problems that interests him/her, develop a plan of personal involvement in addressing the problem and evaluate and reflect upon the experience. 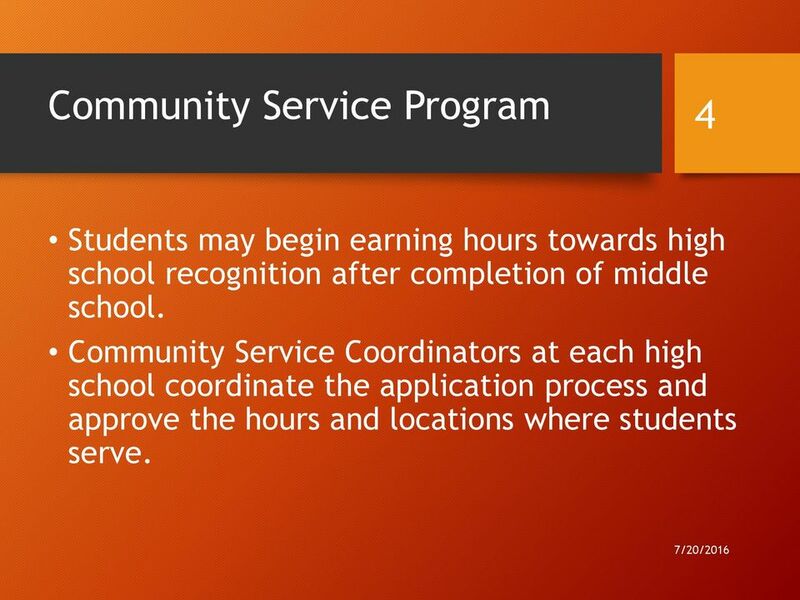 4 Community Service Program 4 Students may begin earning hours towards high school recognition after completion of middle school. 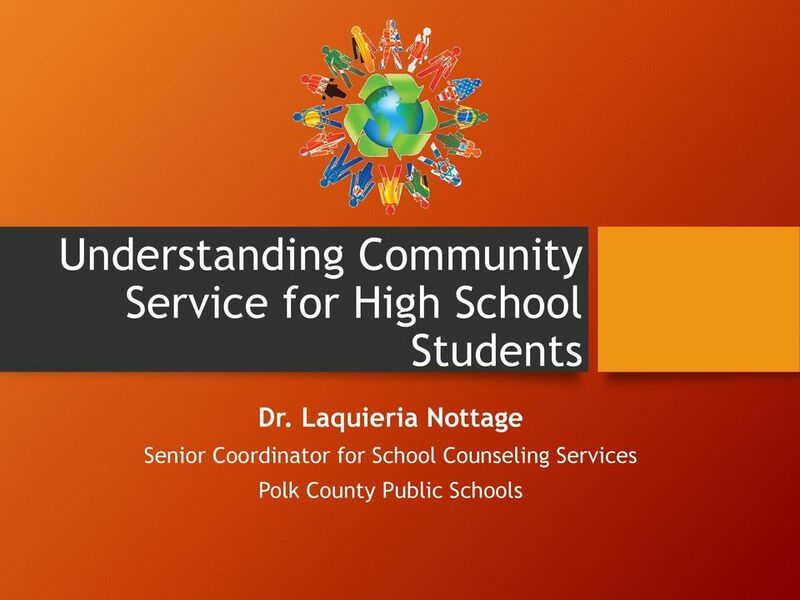 Community Service Coordinators at each high school coordinate the application process and approve the hours and locations where students serve. 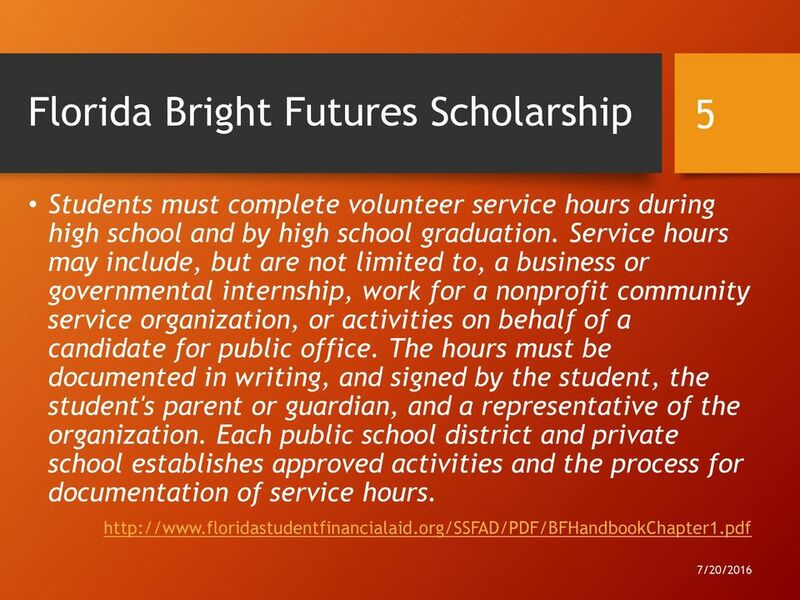 5 Florida Bright Futures Scholarship 5 Students must complete volunteer service hours during high school and by high school graduation. 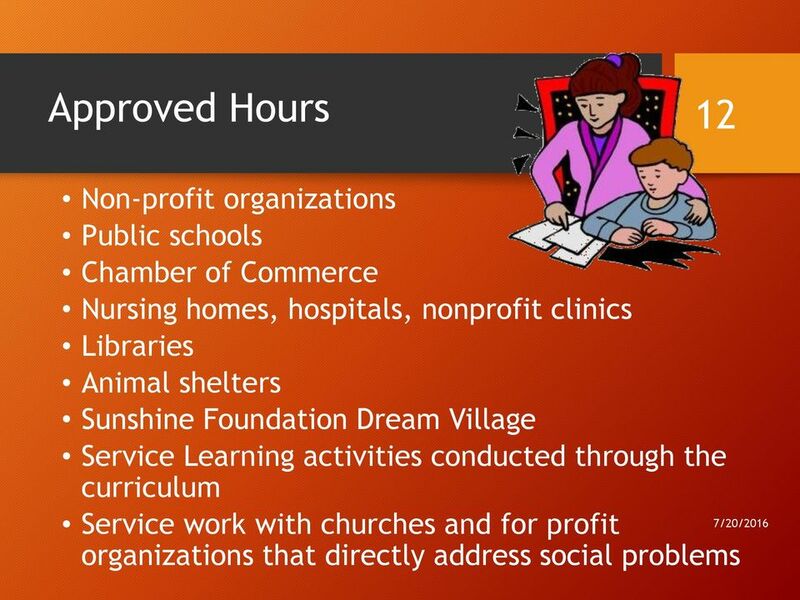 Service hours may include, but are not limited to, a business or governmental internship, work for a nonprofit community service organization, or activities on behalf of a candidate for public office. 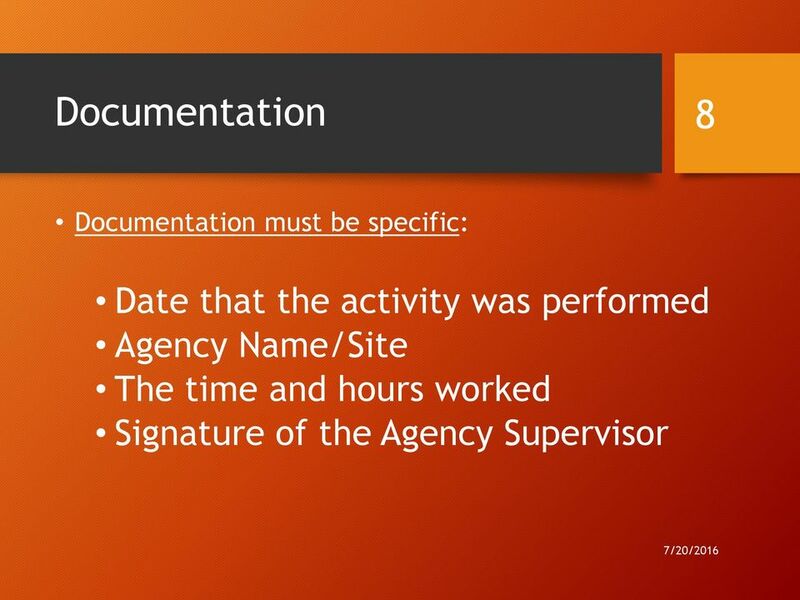 The hours must be documented in writing, and signed by the student, the student's parent or guardian, and a representative of the organization. 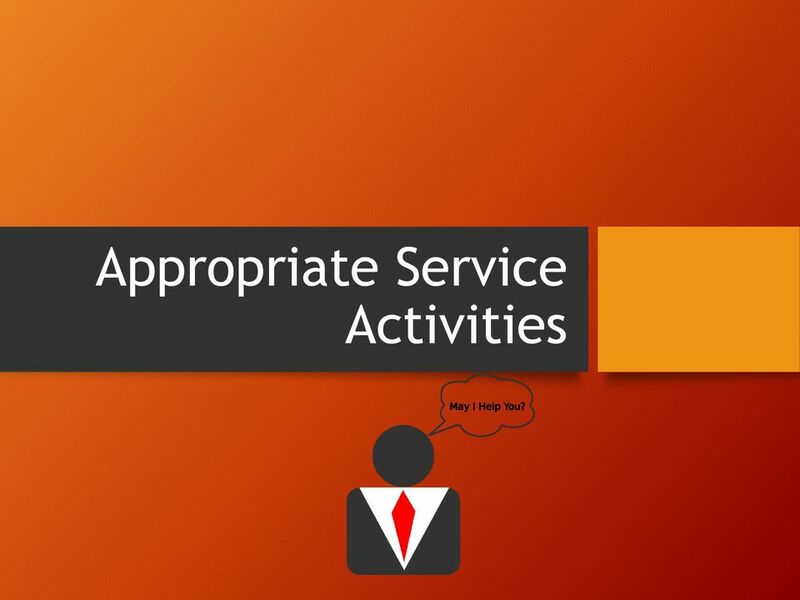 Each public school district and private school establishes approved activities and the process for documentation of service hours. 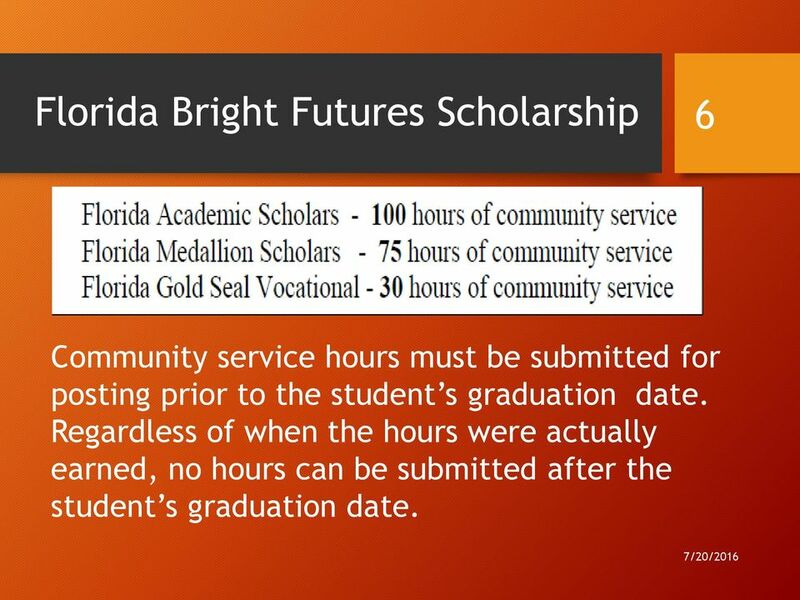 6 Florida Bright Futures Scholarship 6 Community service hours must be submitted for posting prior to the student s graduation date. 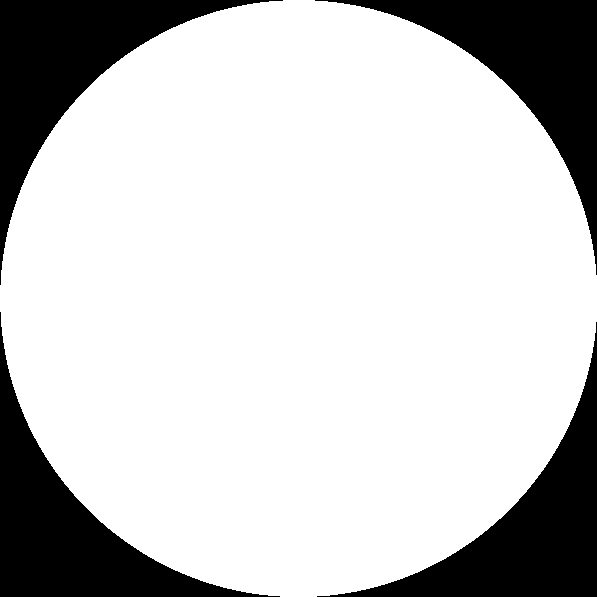 Regardless of when the hours were actually earned, no hours can be submitted after the student s graduation date. 7 What is the Procedure? 7 1. 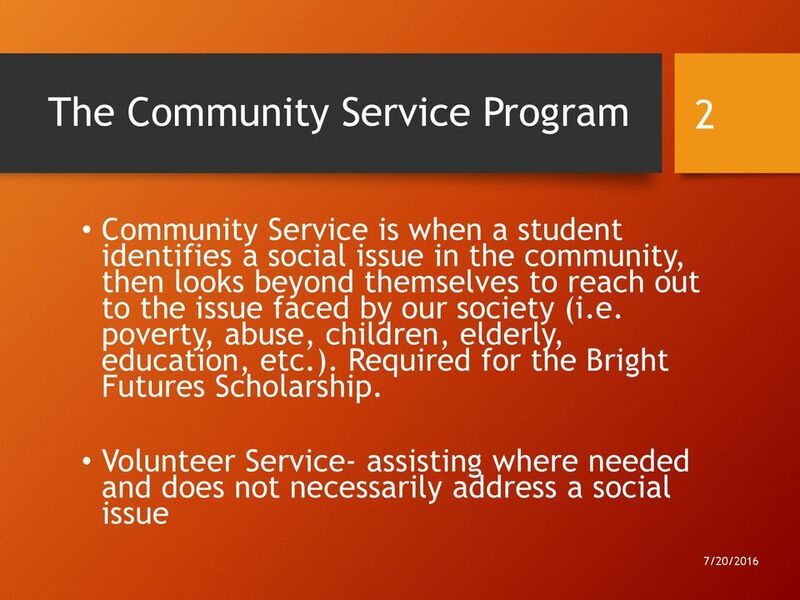 Complete appropriate paperwork (Student Application, Parent Approval Form, and Agency Application) and return to the Community Service Coordinator for approval. 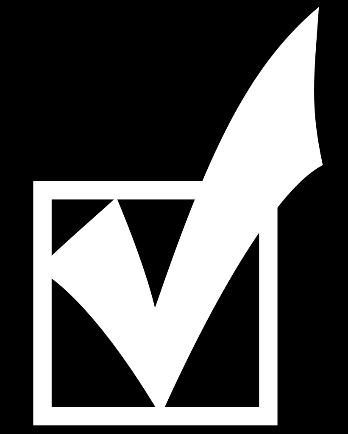 Forms can be located at: 2. 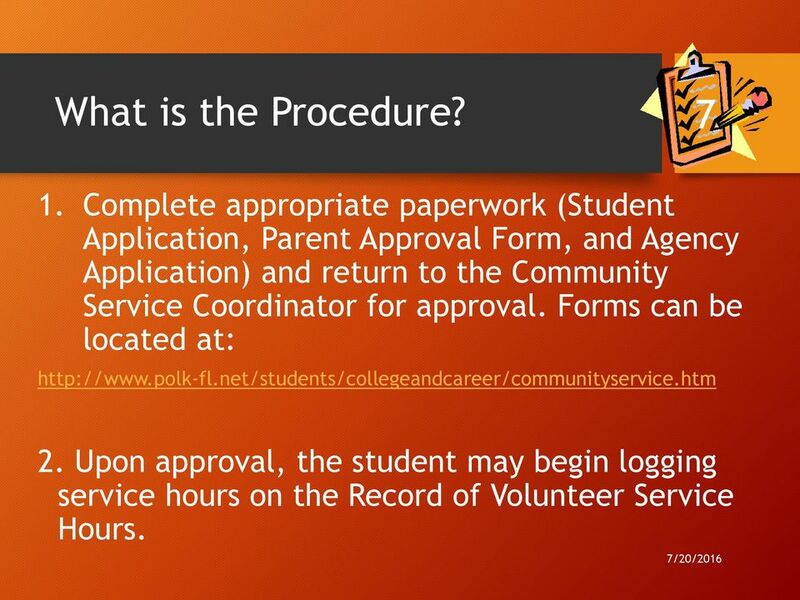 Upon approval, the student may begin logging service hours on the Record of Volunteer Service Hours. 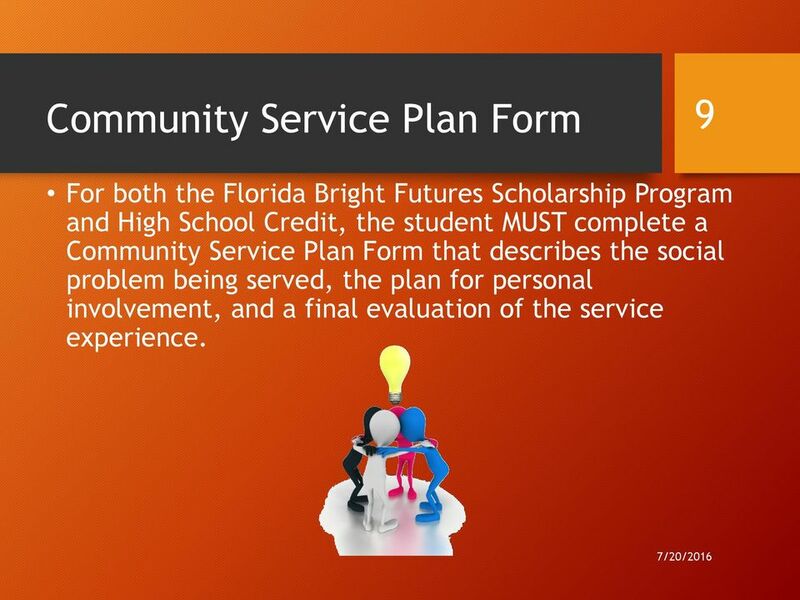 9 Community Service Plan Form 9 For both the Florida Bright Futures Scholarship Program and High School Credit, the student MUST complete a Community Service Plan Form that describes the social problem being served, the plan for personal involvement, and a final evaluation of the service experience. 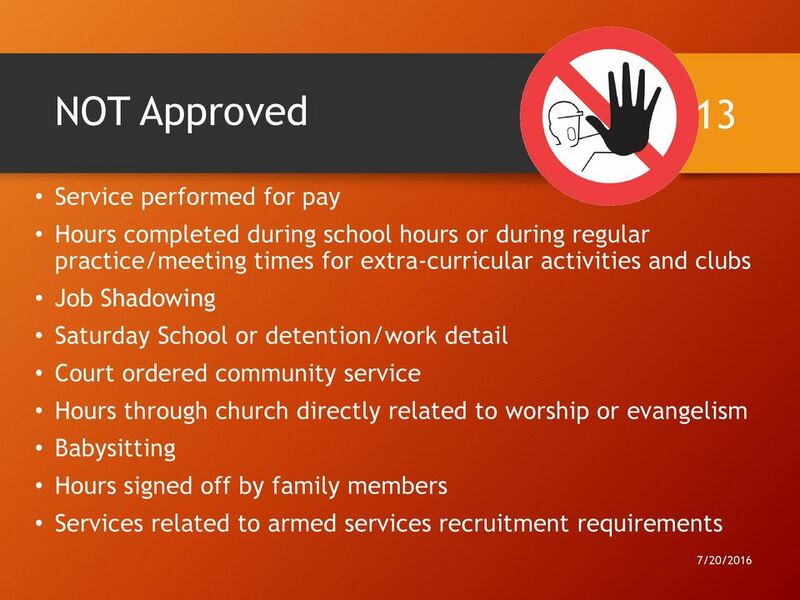 11 Service Hour Approvals 11 School coordinators may verify or deny service hours. The School Principal has the authority to dismiss a student from the Community Service Program. 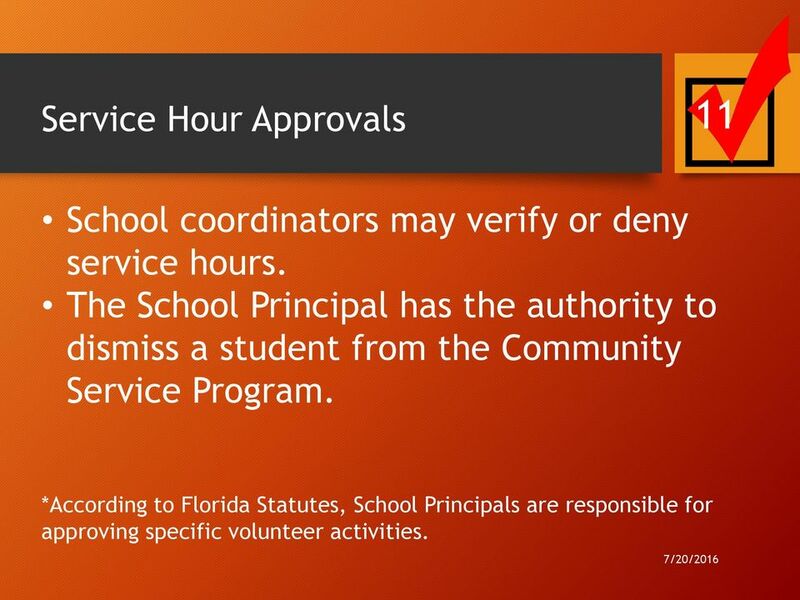 *According to Florida Statutes, School Principals are responsible for approving specific volunteer activities. 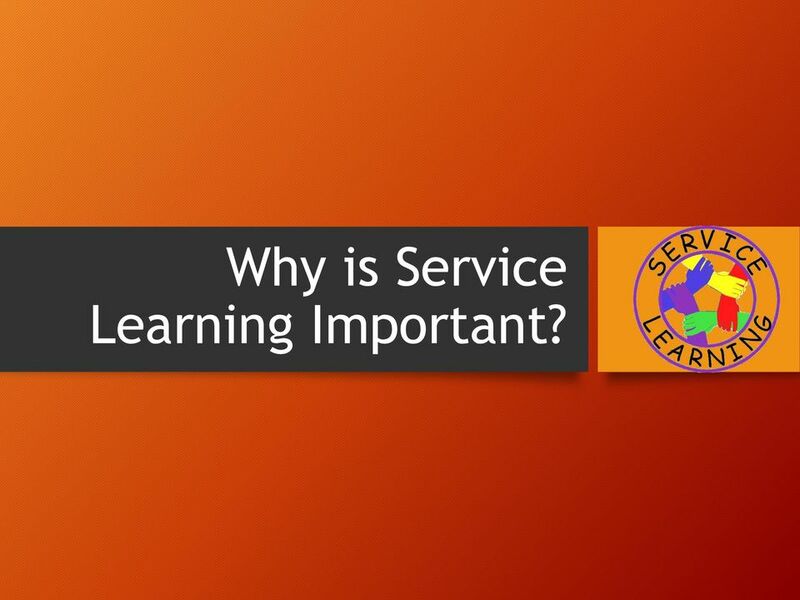 14 Why is Service Learning Important? 15 What Should Students Gain? 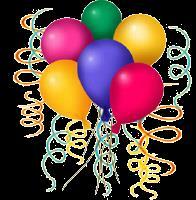 15 The activity should be beneficial to the student and the community. Students can use the opportunity to work in a field that they are interested in learning more about. 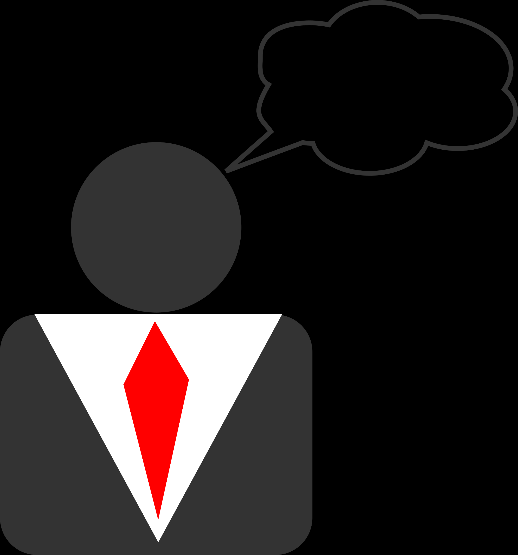 Engagement should be meaningful and relevant for the student. 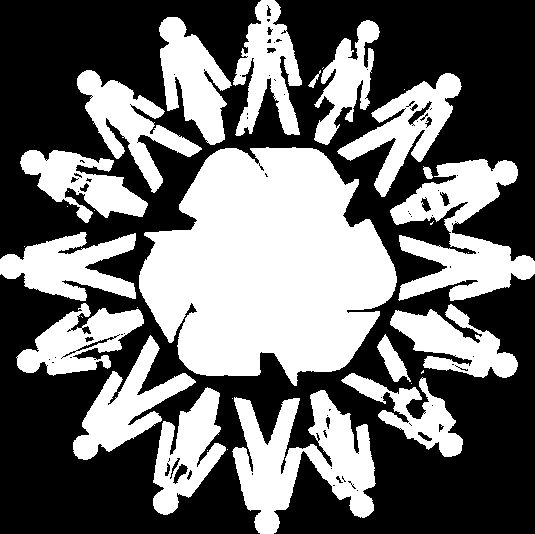 The experience should allow the student to reflect on how they relate to society and their community. 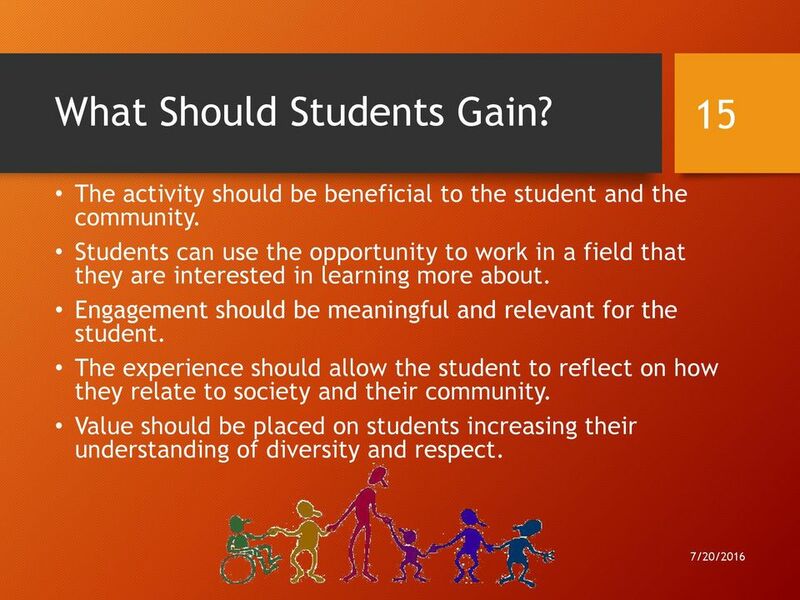 Value should be placed on students increasing their understanding of diversity and respect. 16 What is the Students Take-Away? 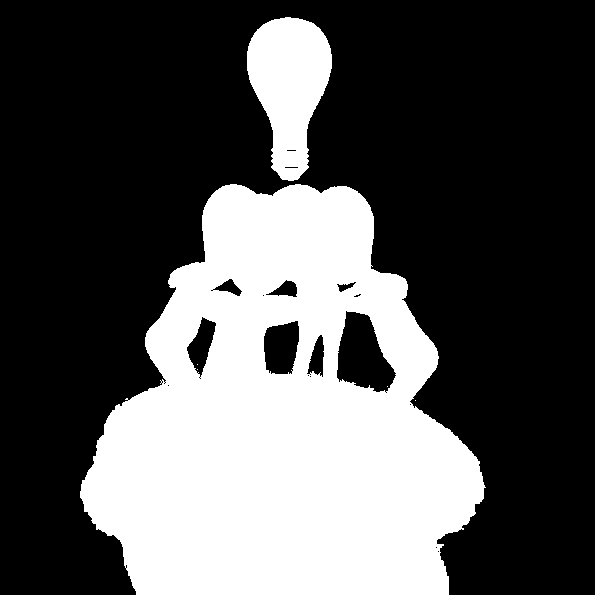 16 ACADEMIC GAIN: Students tend to do better in school. 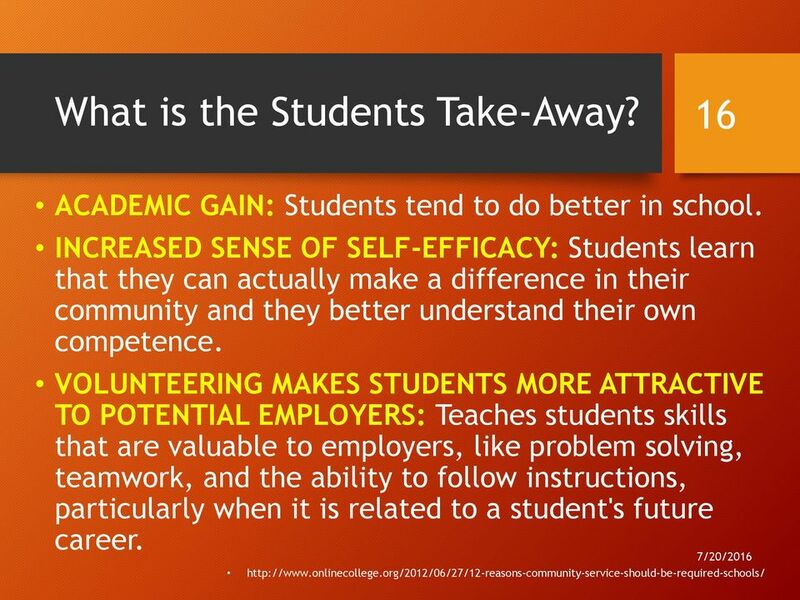 INCREASED SENSE OF SELF-EFFICACY: Students learn that they can actually make a difference in their community and they better understand their own competence. 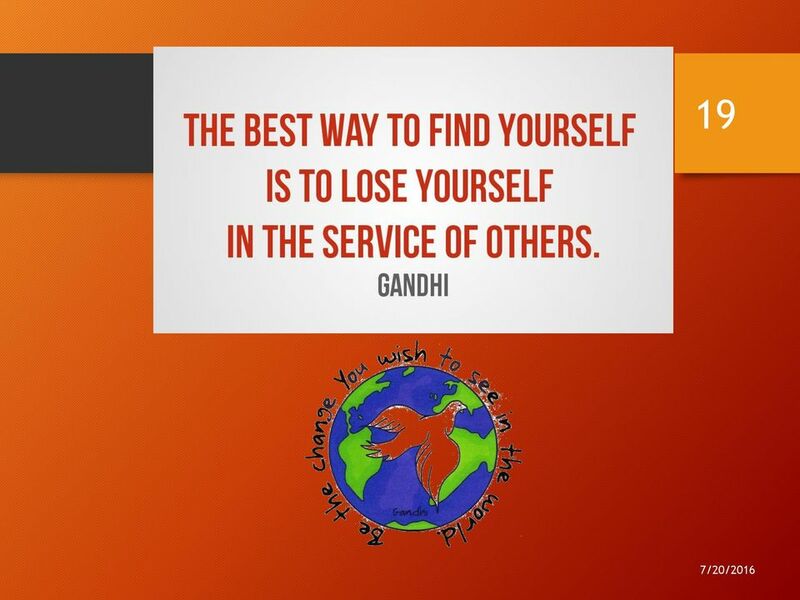 VOLUNTEERING MAKES STUDENTS MORE ATTRACTIVE TO POTENTIAL EMPLOYERS: Teaches students skills that are valuable to employers, like problem solving, teamwork, and the ability to follow instructions, particularly when it is related to a student's future career. 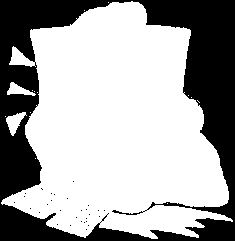 17 What is the Students Take-Away? 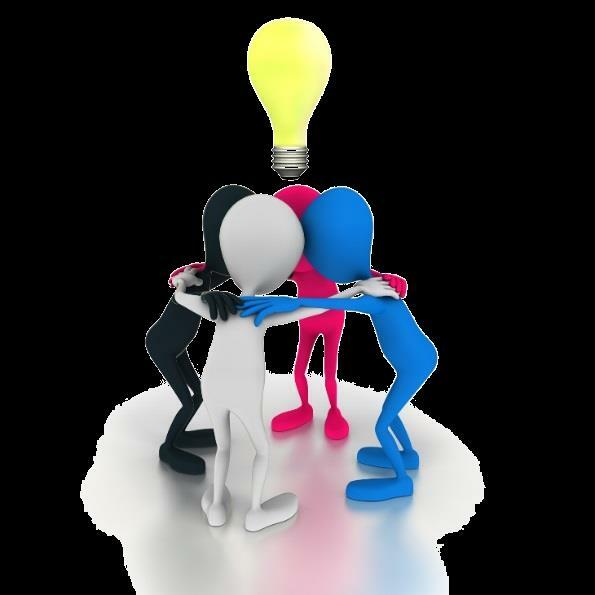 17 STUDENTS CAN ENJOY EXCELLENT NETWORKING OPPORTUNITIES: Opens students up to various networking opportunities to build connections and relationships. 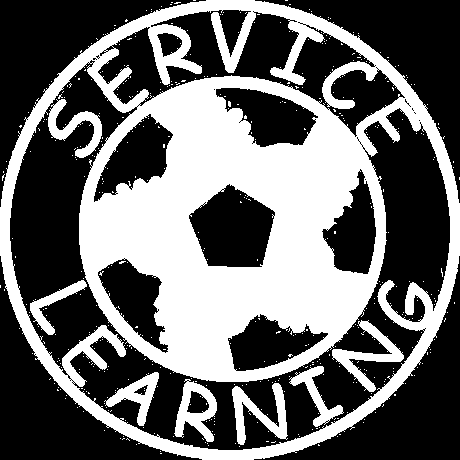 STUDENTS FIND A SENSE OF RESPONSIBILITY AND PRIDE: Students build a sense of responsibility and pride when they see what they've done is actually helping others. 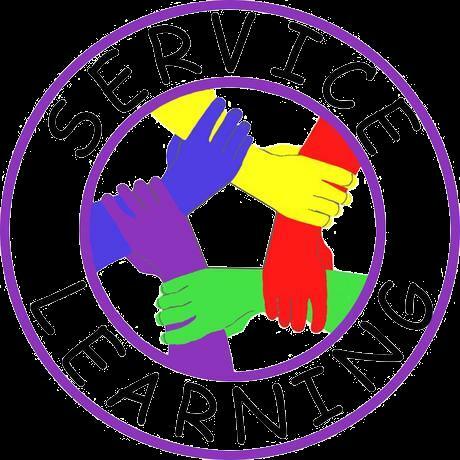 VOLUNTEERING OFFERS AN OPPORTUNITY FOR SKILL BUILDING: Working in a real-life setting, students can use volunteering projects to explore potential careers and work on developing the necessary skill sets. 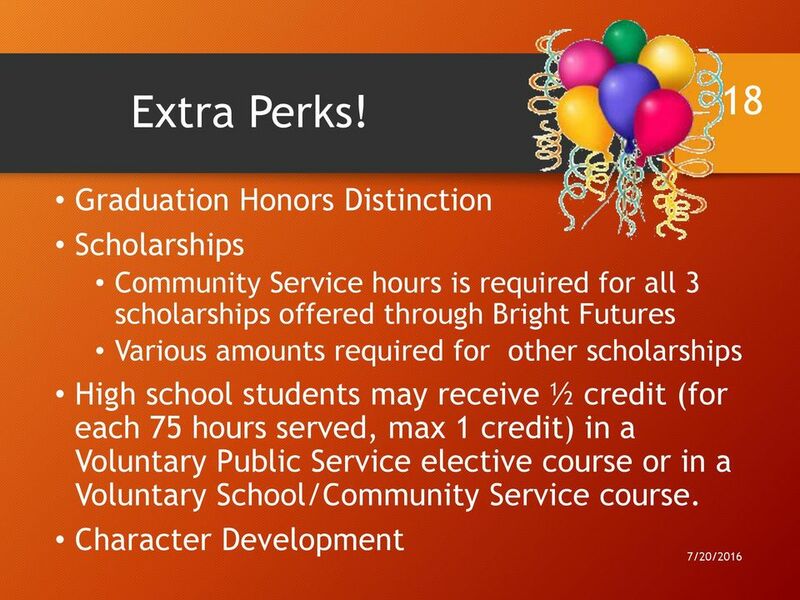 2016 Polk Private Schools Scholarship Application ***This application is only for students qualifying for eligible Polk Education Foundation Scholarships who do not attend Polk public and charter schools. UHS HOSPITALS. 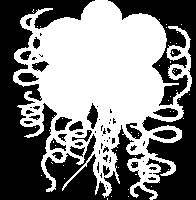 M:\EMPLOYMENT STAFF\Scholarships\Edu Incentive Program Applications & Contracts 2015\RN Scholarship Appl and Contract 032015. SESSION OVERVIEW FACILITATOR GUIDE This 45-minute session will provide students with an introduction to the development of a portfolio that will ultimately document evidence of their strengths and experiences. 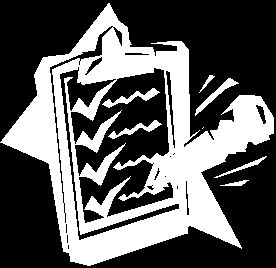 Co operative Education Information A CO OP PROVIDES PRACTICAL WORK EXPERIENCE: You will have the opportunity to gain relevant work experience related to your field of study prior to graduation from UWM. OFFICE OF PRESIDENT-ELECT. Lisa Gonzales, Ed.D.